My laboratory is interested in the development of molecules with biological activities in various areas. We employ three types of molecules as the starting materials or building blocks: carbohydrates, heterocyclic compounds and natural products. For compounds containing carbohydrate components, we focus on the studies of antibacterial aminoglycosides, antifungal aminoglycosides and anticancer cyclopamine-carbohydrate conjugates. New classes of antibiotics with activity against drug-resistant bacterial pathogens, including Klebsiella pneumoniae, methicillin-resistant Staphylococcus aureus (MRSA) and Pseudomonas aeruginosa and vancomycin-resistant Enterococcus (VRE), have been developed. 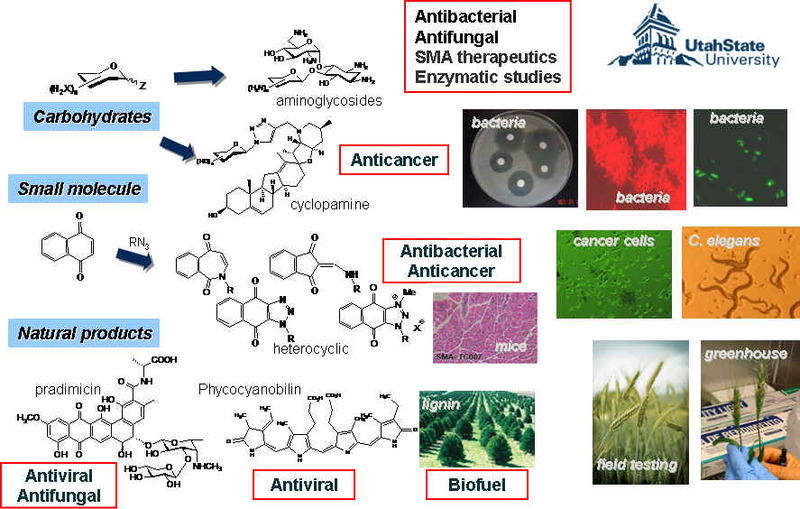 For research on heterocyclic compounds, we emphasize on the investigation of antibacterial and anticancer areas. Leads with selective antibacterial and anticancer activities have been identified. We are also investigating the use of natural products as bioactive compounds or source for alternative energy.